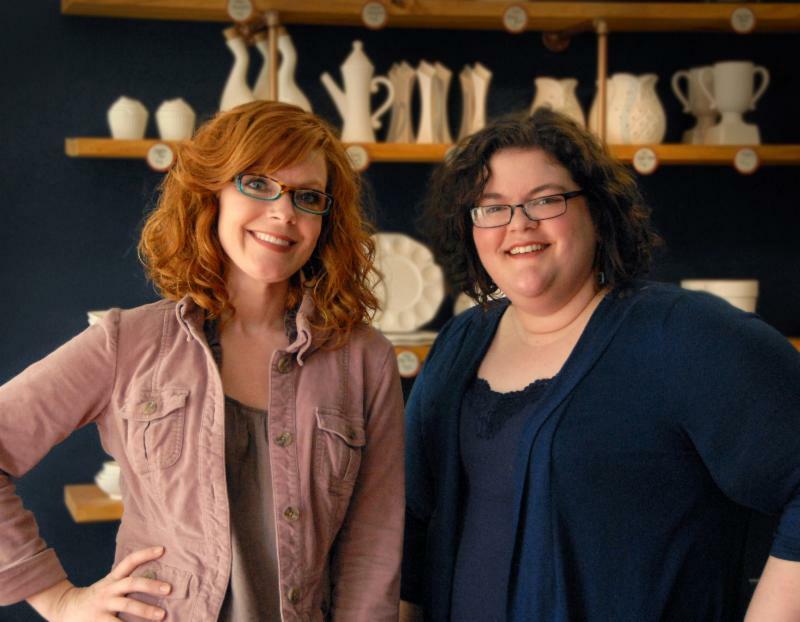 Jennie DiBeneditto and Dawn Spyker together own Silica Ceramic Studio, LLC., in Jeffersonville, Indiana. This educational art studio offers art camps, classes, parties, and more. Jennie and Dawn designed the studio to be a relaxing space for adults to have a wonderful creative experience, but children who love to paint are also welcome! Silica Ceramic Studio, LLC. has a small gallery space where they feature a new local artist’s work every two months. Before becoming an entrepreneur, Jennie was, and still is, a graphic designer. When Dawn isn’t busy at the studio, she is working as an art teacher in Jeffersonville, Indiana. Dawn and Jennie met at the University of Louisville. They are both very passionate about art and started playing around with the idea of starting their own art studio. Dawn and Jennie believed that there weren’t enough art opportunities in the Jeffersonville area. Dawn and Jennie talked about opening their own business for over a year. Their passion for art urged them to move forward with their dream. Three months after taking classes at the ISBDC and legalizing their LLC, they opened Silica Ceramic Studio, LLC. on October 4, 2013. Dawn and Jennie love and enjoy art. They believe that art is therapeutic and gives people a creative release. At their studio, they encourage a creative environment where people can feel comfortable. They enjoy helping customers create pieces that they couldn’t imagine they could create. Jennie’s favorite part of her business is seeing customers create new pieces that they are proud of. She says that she and Dawn have formed close bonds with their customers and continue to meet new people every day. Dawn, with her teaching background, enjoys helping people create amazing pieces and giving them suggestions that help make their pieces come to life. It is hard for the owners to say what their least favorite part about their business is. However, the business side of running the studio was challenging at first because they usually use the artistic side of their brains. Because they both have day-jobs, balancing time is the main challenge the owners face. Although the studio just opened last October, they have already seen over 400 customers walk through their doors. New people come in daily to check out their studio and get information about the classes and other services they provide. Jennie and Dawn have been working on a new project that entails opening an art shop across the street from their current location. The shop will feature existing artists’ work from around the community. Jennie and Dawn envision that the shop, Gadabout Gallery and Artisan Shoppe, will have jewelry, purses, woodworking, and other hand-made pieces. So far, the business owners have gotten great feedback from their customers who can’t wait for the new shop to open and some even wish to have their art featured. Jennie and Dawn have made many contributions to the community. They are both founding members of the Jeffersonville Art Alliance. They feel that the city was lacking community art work, and they work with various organizations to change that. The JAA offers free community art sessions where the community is invited to come together to create a large part of public art. The most recent artwork was inspired by the work of Louise Nevelson and was recently placed in the lobby of Clark Memorial Hospital. It’s their largest piece yet, measuring four by eight by seven feet tall. Jennie, who is a client of Bryan Potter, Southeast ISBDC Business Advisor, says that she couldn’t have started her business on such solid ground without the help of Bryan and the whole SBDC center. Jennie and Dawn, clients of the Southeast ISBDC since April 2013, are first and foremost creative people, so Bryan really helped with the financials and business side of their studio. Jennie says that Bryan helped them get a well-rounded idea of their business. “Jennie and Dawn were able to use their passion and connections in the art community to add an amazing addition to Spring Street in Jeffersonville. Their studio allows for anyone at any level to have an enjoyable artist experience. Their hard work and attention to details has allowed them to experience quick success in their business,” Bryan says of Jennie and Dawn. ← IP And the Most Wonderful Time Of The Year? !